This month we are showcasing Chineke! Orchestra violist Nicola Hicks! Nicola completed her Bachelor’s and Master’s degrees in music as a student of Dr. Louise Lansdown at the University of Manchester and the Royal Northern College of Music (RNCM), respectively. Whilst in Manchester, Nicola regularly explored new, experimental compositions that combined instrumental performance with electronics, visual arts and graphic scores; areas that she hopes to investigate further in the future. Nicola has attended and performed in master classes given by Donald McInnes at UNC, Thomas Riebl at the RNCM, and at The Juilliard School with Samuel Rhodes and Paul Neubauer. In chamber music groups, Nicola has performed in master classes given by the St. Lawrence and Brentano string quartets. 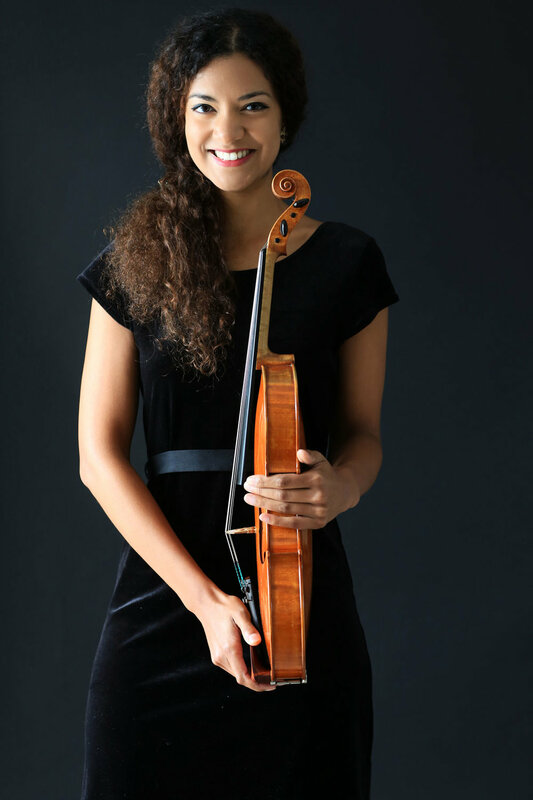 As a member of the Simple String Quintet, Nicola was a winner of the 2014-15 Southard Award at UNC. Nicola has performed in concerts at Higham Hall (the Lake District), the Birmingham Conservatoire’s Chamber Music Festival, and the International Musical Arts Institute in Fryeburg, ME. At these festivals she performed in groups alongside musicians such as Max Zorin, Martin Storey, Ben Sayevich, and Jason Fisher. As a young child I was exposed to an eclectic range of music from my father’s vinyl collection. The inspiration to learn a string instrument came from a storybook cassette tape that I loved as a little girl. At the end of each chapter, there was an extract of Vivaldi’s Autumn violin concerto and that was when I began constantly requesting violin lessons…finally my parents gave in! Music became a serious part of my life after I joined the National Youth Strings Academy, leading the viola section under the late Sir Neville Marriner. I gained a true insight into what playing in a professional ensemble could be like and that inspired me to study music after leaving school. How to channel my musical enthusiasm and efforts through efficient practice technique. My initial introduction to the Chineke! Foundation was through Julian Lloyd Webber who, as principal of Birmingham Conservatoire, contacted me on a recommendation. I thought the idea of Chineke! was brilliant and ambitious. I was anxious to see what would happen considering no single member of the orchestra regularly played with any other member. I also wondered how the public would receive the orchestra. As I walked on stage at the first Chineke! performance, I was struck by how amazingly diverse the audience demographic was. That element alone told me Chineke! was already championing positive change. My understanding of the need for organisations like Chineke! developed when, in 2016, I attended the Global Symposium on Diversity and Inclusion in Classical Music presented by the Sphinx Organisation, in partnership with Chineke! The discussions and presentations that took place that day were sobering, fascinating, and highlighted just how complicated, deep, and multifaceted the mission of advocating inclusion in classical music really is. Although I have not personally experienced overt challenges as a BME musician, it is possible that I have unknowingly been subjected to the naïve and innate prejudices of others. Classical music is full of stigma and traditions that discourage inclusivity and at some point most of us have been unwittingly guilty of perpetuating these. Chineke! raises awareness, educates, and invites people from all ages and backgrounds to enjoy classical music and that is what I love about it. I am proud to have successfully auditioned for a place on the Doctorate of Arts programme at the University of Northern Colorado where I was also offered a position as Viola Teaching Assistant. During my time there, my string quintet won the Southard Award 2014-2015. At the end of August I will be joining Chineke! for their BBC Prom performance at the Albert Hall and I am confident I will not be the only person for whom this becomes one of their proudest musical moments! The opportunity to play with Chineke! arrived exactly at the same time that I moved back to England from studies abroad and it provided me with a fantastic new network of talented music colleagues and great new friends. Practice as wisely and efficiently as possible, attend the best live performances you can, experiment, and question what you hear and know so that your knowledge can grow. Diversifying classical music may take time but every BME player can contribute to positive change simply through being an inspiring and honest musician.